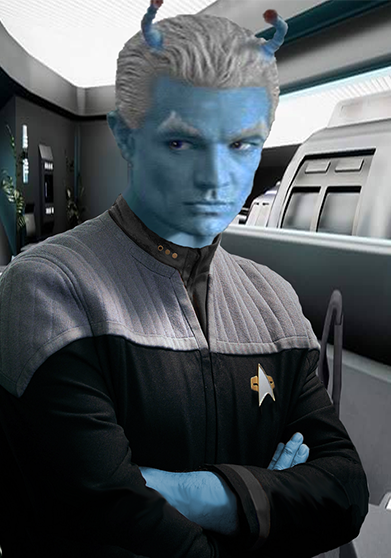 Ras is an Andorian thaan. He was born into a loving family bondgroup. His parents had a varied skill set, from a Diplomatic Officer within the Klingon embassy on Andoria, a commercial shuttle pilot, a local law enforcement agent and a chef. All passed on their skills as well their love and affection to Ras over his youth. He enjoyed spending time with each and everyone of them and continues to have a close relationship with them. During his schooling Ras became fascinated by History. He enjoyed reading about the old Andorian Guard and conflict with the Vulcan’s, as well as all information regarding Andoria’s part in creating the Federation. In his late teen’s he joined his own bondgroup, they tried many times to convince a baby and eventually did. He has a 15 year old daughter, but due to his position in Starfleet and differences in the way she wants to live her life, they haven’t spoken for a few years but still gets regular updates from his other bondgroup. He graduated in the top 2% of his class at the academy excelling in Diplomacy, Tactics, piloting and hand to hand combat. In the final year at the academy he was approached to join Starfleet Intelligence, an opportunity which he jumped at. After Graduating Starfleet Academy, Ras was put to work on the USS Hawking as an Intelligence Officer. The Hawking’s primary mission was provide Intelligence on enemy fleet movements and report back to SI. The Hawking saw plenty of action over the course of the war. They saw and took every opportunity which came their way from sabotage, misdirection and all our assaults on installations. Ras was involved in every covert operation the Hawking undertook. Whether it was precision planning or being part of the team that went on the mission. After the war ended Ras was promoted to Lieutenant JG and given numerous awards and medals for his contributions in the war effort. He was reassigned to Starfleet Intelligence HQ were he worked on the logistic side of the service. The move was a personal request as he wanted to see the inner workings of Starfleet Intelligence. For 3 years Ras served as a Logistics Officer for SI, making sure all operations received the correct equipment and on schedule so the operations or missions went ahead without any problems. When an undercover mission to pose as a criminal in the Orion Syndicate to find out If reports of the Syndicate and Gorn were working together, Ras jumped at the opportunity. He went in for 18 months, results on his findings were classified. He then joined the USS Repulse as Chief Intelligence Officer. The Repulse was assigned to patrolling different areas of the Beta Quadrant. She also gathered intelligence on Romulan, Klingon and Gorn fleet movements in the area. After 4 years on the Repulse, Ras was offered the chance to return to Starfleet Intelligence HQ as part of the Field Operations department. In 2389, Ras was promoted to Lieutenant Commander and offer the newly created position of Deputy Director of Intelligence in Task Force 93.